Can You Eat the Skin on Muenster Cheese? Several well-known aged cheeses are non-melting, as well as some lesser-known varieties. 2 Which Cheeses Go With Honey Ham? 3 What Is Animal Rennet? When cooking with cheese, you must know how well the cheese melts. 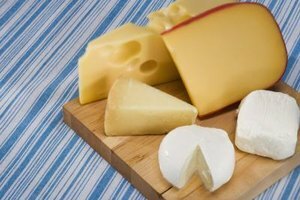 Some cheeses melt easily, incorporating themselves seamlessly into dishes, while other cheeses melt somewhat -- think of the mozzarella on pizza -- but never lose all their body or consistency. The non-melters, several of which are aged, include cheeses with a chemical makeup that refuses to accommodate a flowing fondue or a grilled panini. Aging a cheese does not cause it to be a non-melter, but the process adds complexity and flavor to cheeses that are more often than not enjoyed on their own. Feta cheese, which originated in Greece and is thought to be one of the first cheeses ever made, is an aged, brined cheese with a texture that ranges from creamy to crumbly and has a salty or tangy taste. True feta cheese is made from a combination of sheep’s and goat’s milk, but you can find “feta-style” cheeses -- most of which are produced outside of Greece -- made from cow’s milk in many stores. It is the extremely high salt content that renders feta non-melting. It is often served on cheese platters, sliced very thinly, or crumbled over salads, pastas and vegetable dishes. Parmigiano-reggiano is an extremely hard, aged cheese from Italy. It has a sharp, nutty taste and an inedible rind. Due to its low moisture content, it will not melt on its own, but if grated finely and added to a high moisture dish such as some pastas, it will incorporate itself into the sauce to some degree. Parmigiano-reggiano is often served as a dessert cheese, because its flavors contrast well with sweeter cheeses, fruits and sweet dessert wines. Aged goat cheese is a less-common form of goat cheese, which is often known only in its fresh incarnation, at least in the United States. The rind of aged goat cheese is infused with mold, which protects the cheese inside and gives it a creamy texture and complex taste. The rind is edible, although many people prefer to remove it before enjoying the cheese beneath it. Goat cheese does not melt due to the presence of extra whey, which is a form of protein usually removed during the cheese-making process. The whey protein binds with the fat in the cheese and refuses to let go, thus maintaining the cheese’s texture and body even when heated. A classic non-melter, halloumi is a lesser-known aged cheese. Native to the island of Cyprus, halloumi is a semi-hard, brined cheese with a very high pH level. It's this low-acidity that makes the cheese unmeltable. It is aged in brine, which adds flavor and hardens the cheese. Halloumi is often served grilled, which cooks the outside of the cheese to a caramelized, golden-brown finish and just softens the inside of the slice.